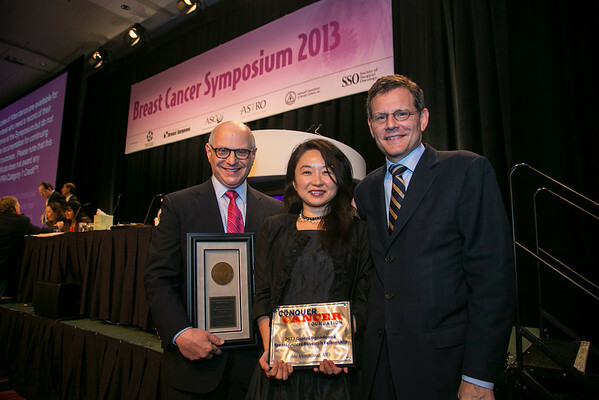 San Francisco, CA - 2013 Breast Cancer Symposium: Dr. Larry Norton recieves the Gianni Bonadonna Breast Cancer Award and Aki Morikowi, the Bonadonna Fellowship awardee, center, with ASCO President Cliff Hudis at the ASCO Breast Cancer Symposium here today, Sunday September 8, 2013. The Symposium is supported by ASCO, the American Society of Clinical Oncology, ASTRO, the Society of Surgical Oncology and SUO, the American Society of Breast Disease, The American Society of Breast Surgeons and the National Consortium of Breast Centers. Over 1,000 physicians, researchers and allied healthcare professionals are attending the meeting which is being held at the Marriott Marquis in San Francisco and features the latest Breast Cancer research in the areas of basic and clinical science. Date: Sunday September 8, 2013. Photo by © ASCO/Todd Buchanan 2013 Technical Questions: todd@medmeetingimages.com; Phone: 612-226-5154.